Hello world. We are already back home from four weeks backpacking in Myanmar (Burma). And this is certainly a different way to blog: to start when you’ve just arrived home. It has taken me three nights to get back into a normal sleeping routine. Myanmar is 4.5 hours behind Melbourne time, so while I was writhing and twitching in bed at 2am or drinking milk and eating peanut butter sandwiches in the wee small hours with my daughter Ashley (who also has had trouble getting back to normal time), my mind wandered back to Myanmar and its people. Over the past three days, the glorious Myanmar fog has lifted and almost disappeared completely. I liken that foggy place to a middle world – it’s neither a travel life nor a normal life. It’s a no mans land, and I’m trying to hold onto it as long as I can. Due to the lack of working internet in Myanmar, I had to abandon my grand plans of travel blogging from the ground. On the upside of this disappointing set of circumstances, I went back to pen and paper and thoroughly enjoyed the act of writing about what we experienced, felt and saw on our intrepid backpacking journey throughout Myanmar. It also gave me more time to take pictures and simply watch people doing what people do best – going about their daily lives. I have a handful of digital blog entries on Pages in my iPad that I quickly typed up, at another ungodly hour, on an overnight bus trip. But that’s it! 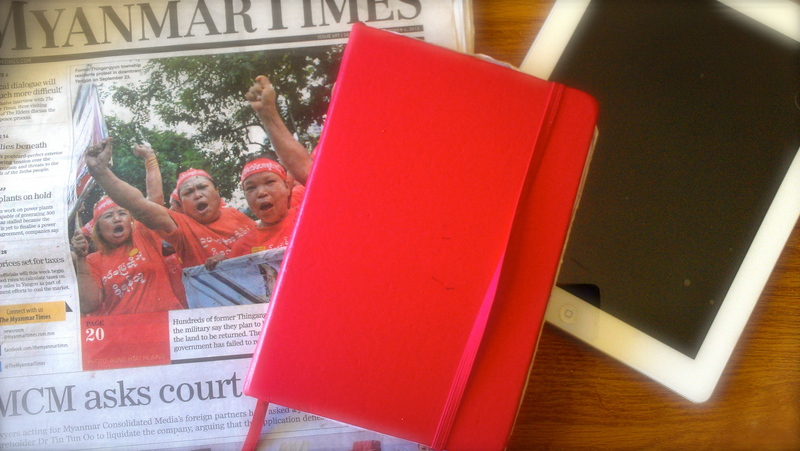 So the tools are my little red travel journal, iPad, photos and the Myanmar Times. There were times when I was able to connect the iPad to a faint wi-fi signal and many of you have already seen some of the images I was able to upload short blurbs of description onto Facebook. So I’ve been thinking about the best way forward when I’ll be working backwards! And I’ve transformed this predicament into an opportunity. I am still going to blog about our amazing journey to Myanmar (because it was AMAZING) but with a difference from the way I blogged last year in Vietnam. Instead of short and snappy blog posts (due to being on the go all of the time), I’m going to delve deeper and wider. Most of the blogs I’ll upload will be long-form narrative nonfiction blogging (I think I just made that up!) which means that I will write more in-depth blogs with some research about the places, people, politics, problems and possibilities of Myanmar that we experienced while we were there. I’ll also be writing about where we donated the A$3,000 we raised from our Burma Bands fundraising effort and share the snaps too. I hope to be able to provide you with a greater knowledge of Myanmar’s past, present and future – fog or no fog. I’m excited; hope you are too. PS Just so you know, I’ll upload a new blog each Friday. So the first one is next week folks!